The fashion event, FROST, has opened this week and there you'll find the new dress Frost in three muted colors (Blue, Pink, and Green) along with a variety of matching & contrasting Frost Knit scarves. You can find a teleport there by clicking here. New in store is the Lavish II dress. The beloved trained dress now with a halter top in a silky pattern and optional bow. 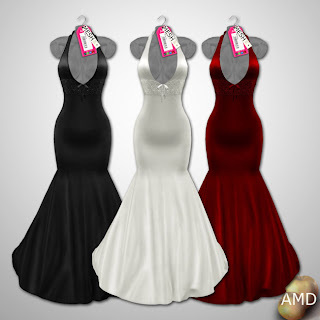 You can find the new edition in the classic 3 romance colors: Pearl (white), Red, and Black. If you'd like to wear this dress (or any AMD formal wear) for a special occasion, I do take recolor requests.... just don't wait to the last minute to send in a request please!